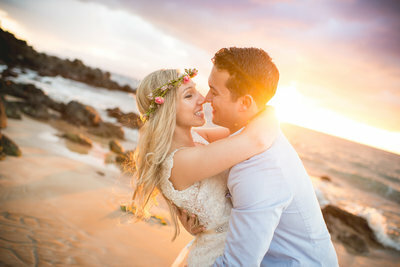 With family and friends, plus the most stunning scenery surrounding them, this bride and groom were ready to say, “I do” at their Maui Venue Wedding. As Chelsie finished getting ready with the help of loved ones, we could see the excitement in her eyes to finally marry the love of her life. As she prepared to make her way down the aisle, we could tell this would be a day she would never forget! Prior to our bride’s big entrance, her niece and nephew, Sadie and Tyler led the way with balloons and the cutest sign, “Here comes ChiChi”. So sweet! 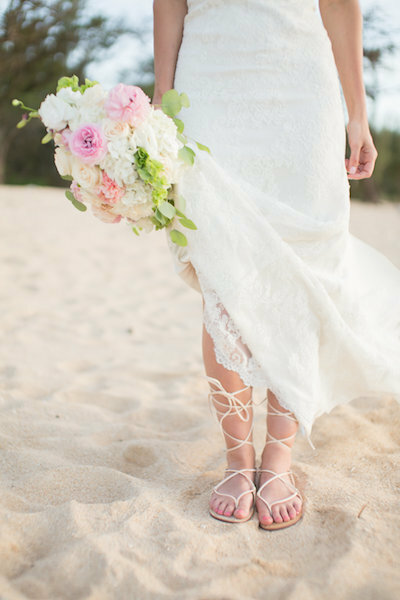 We love when couples add little personal touches like this for a Maui Venue Wedding. It makes it all the more special! After their beautiful ceremony, our newlyweds were ready to head down to the beach for wedding portraits. And we are obsessed with the way Chelsie’s wedding dress glistened in the setting sunlight. The lace and beaded details on this dress were absolute perfection and she wisely chose to wear her hair up to show off the back! We love it! 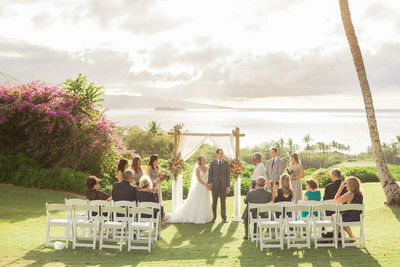 Thank you, Chelsie and Caleb, for inviting Simple Maui Wedding to celebrate with you on such a special day! We wish you a lifetime of happiness and love together. Congratulations and Warm Aloha!